We assessed the reliability of a concept design for a Submerged Floating Tube Bridge. The Norwegian Public Roads Administration (NPRA) investigates the potential of a ferry free coastal highway E39. Norway's coastal highway E39 runs along the western coast of Norway. There are eight ferry connections along the route that cross wide and deep fjords. By bridging the fjords that can currently only be crossed by ferries, the total traveling time can be significantly reduced. Sulafjorden is one fjord along the route E39 approximately 250km southwest of Trondheim. The fjord has a depth of 500m and the crossing width of the fjord is 3.8km. 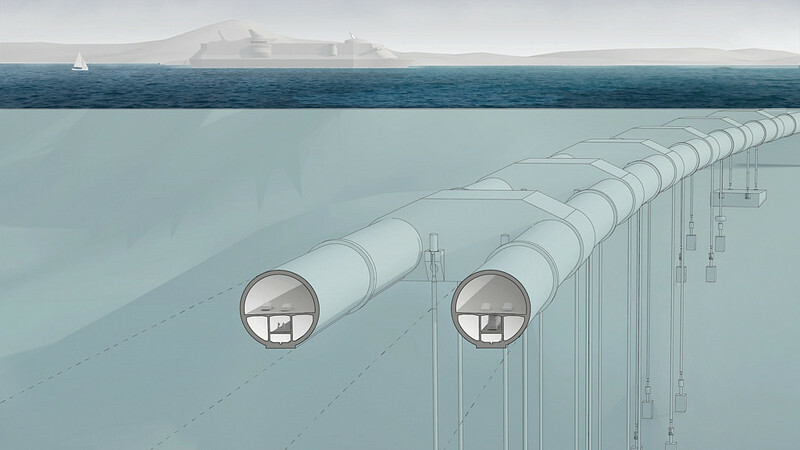 For Sulafjorden, the potential of a submerged floating tube bridge (SFTB) is investigated. A submerged floating tube bridge can be classified as a marine structure; and hence it cannot be placed in the same category as classical tunnels or bridges. As a consequence, the design of such a structure based on EUROCODE has shortcomings, as EUROCODE is not intended to be applied for the design of marine structures. The combination factors given in EUROCODE seem to be overly conservative for submerged floating tube bridges. For example, the concrete tubes are constructed in a dry-dock, and the the actual self-weight of the concrete tubes can be measured relatively accurately by means of Archimedes’ principle. Consequently, the uncertainty about the weight of the concrete tube is reduced to the measurement of the freeboard of the structure. A load factor for self weight of 1.3 as suggested in EUROCODE is overly pessimistic and not economical. According to EUROCODE 0 (EN 1990, basis of structural design) a probabilistic design approach can be used as an alternative to the design based on safety factors. In this context, Eracons was asked to quantify the uncertainties and to assess the reliability of a concept design for the submerged floating tube bridge (SFTB). The primarily considered failure modes were: (i) Loss of tension in the tethers that anchor the tubes to the seabed. (ii) Exceedance of the maximum allowable tension in the tethers. (iii) Water tightness of the tunnel tubes that surround the roadways. A major part of the input uncertainties is due to wave induced loading. As it is computationally demanding to evaluate the corresponding wave induced stresses in the structure, Eracons developed a probabilistic surrogate model to represent the hydrodynamic response. The uncertain parameters in the probabilistic model for the sea state where learned based on recorded data of historical sea states. Based on the developed probabilistic model for the SFTB, the ballast load in the tubes was selected such that the reliability of the system becomes near optimal under different load scenarios.